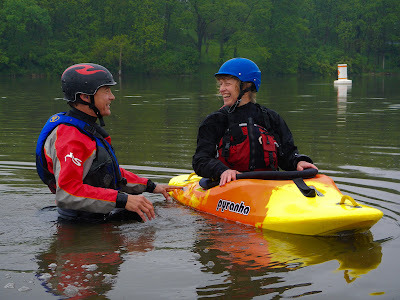 So it was a pleasure for Sharon to spend Memorial Day weekend teaching a Level 4 Open Water Kayak Training for Geneva Kayak Center with Scott Fairty, one of our coaching mentors. 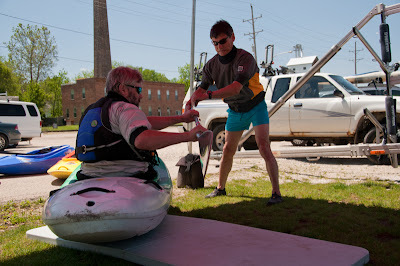 Designed to help participants work on the skills they'll need for an American Canoe Association Level 4 coastal skills assessment or a British Canoe Union four-star sea leader assessment, this course simulates tidal features by using the Menominee River in Wisconsin and then chases exciting conditions on Lake Michigan and Lake Superior for wind, waves and surf. 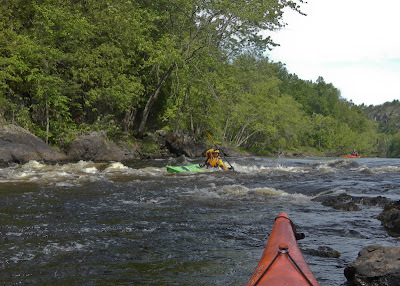 The large-volume Menominee River provides current and class I and II rapids--perfect for working on eddy turns, peel-outs, attainments and ferry glides. The Menominee is one venue that allows midwestern paddlers to develop skills needed for paddling in ocean currents. In addition to moving water, it offers eddies, overfalls and other ocean-like features. 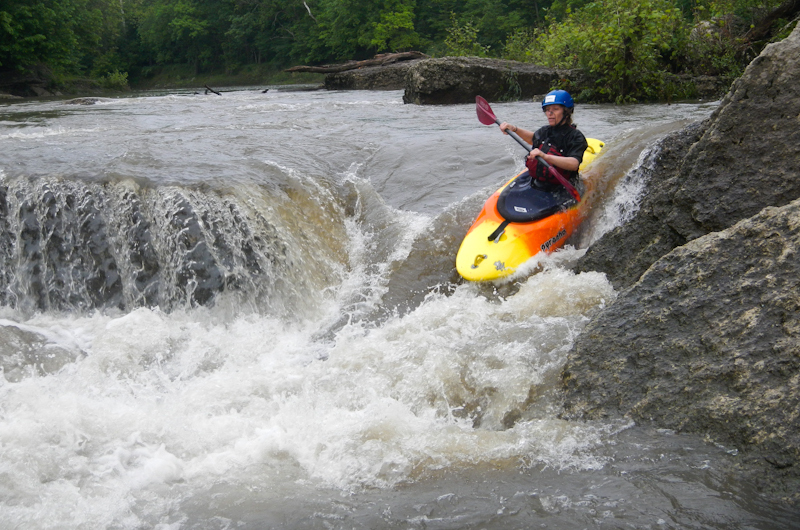 It demands precise maneuvers of paddlers who wish to avoid getting washed downstream and hung up on rocks. We spent the first day on the skills necessary to successfully enter and leave eddies, ferry across the river and attain upstream. Storm coming in. Load the boats and head for the water! Then, as predicted, the sky clouded over, the wind picked up, and the temperature dropped. 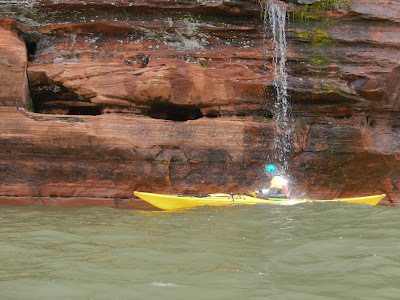 The weather was custom-made for a Level 4 course in the Apostle Islands, so we loaded up and drove to Lake Superior, where the forecast for the next day was winds of 15 to 25 knots out of the northeast and waves of 5 to 7 feet. Near shore, the waves were far smaller, allowing for some practice launching and maneuvering in conditions. We paddled out to Sand Island, beloved for its sea caves, where we had lunch in the refuge behind a park service building. Lunch the the lee of a park service building. Then we set out in search of larger waves, which we found slightly further along the shore. We paddled out into 5- to 7-foot waves with the wind howling in our ears, then turned around and paddled back with the wind and waves behind us. 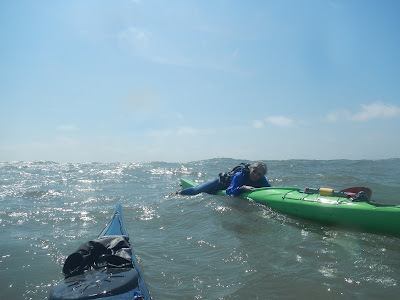 These are serious white-knuckle paddling conditions for intermediate paddlers; these participants impressed us with their mental and physical fortitude. They're also challenging conditions for navigation and course plotting because the wind figures into the calculation. We practiced various ways of accounting for the push of the wind, and ended the day exploring the power of the waves along the shoreline. We debriefed over pizza ("Serves five? We'll take two of those! 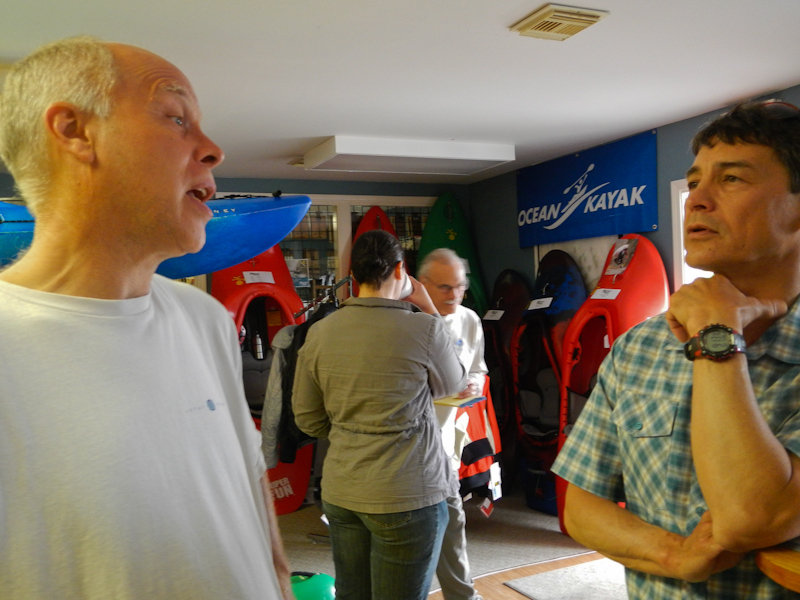 "), discussing paddling strategy in wind and waves, risk management, rescue strategies and other facets of the day's experience. Overnight, the winds calmed and shifted to the southwest. The next day was perfect for rock gardening, paddling through arches and poking into sea caves. 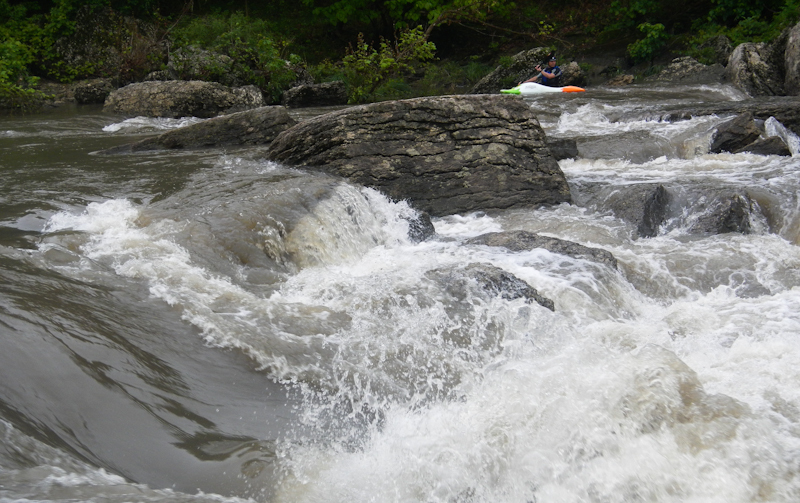 Bill paddles out between two rocks, just ahead of a surge. Rock gardening is all about timing and stroke placement. Do it right, and it looks easy. Do it wrong and you're stuck on a rock. It's fun in its own right and great practice for paddling on the ocean. 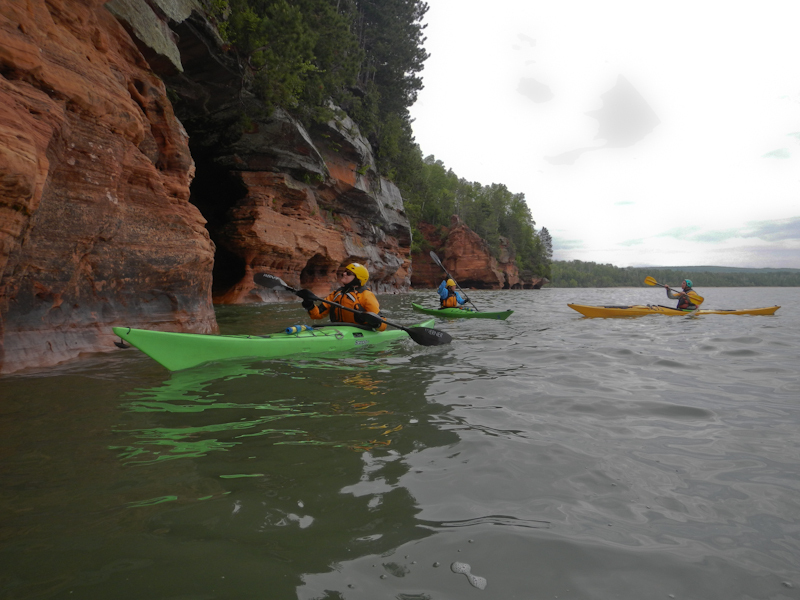 Paddling along the sea caves. The waves were all but gone by the afternoon, allowing us to practice extracting boats from sea caves along with other rescues. The cold water -- barely 40 degrees -- provided an incentive for quickly getting people back into their boats. Scott showers off below a waterfall. During the final debrief, we talked about what we had worked on and what people had learned. Everyone said they had learned new skills, some of which they had not realized they lacked and needed. Everyone knew they needed to work on the speed and efficiency of their towing and rescue skills. And everyone had fun, which, at the end of the day, is why we paddle in the first place. *"Intermediate," of course, means different things to different people. Some cease to call themselves beginners after their first class. We would define an intermediate as someone with fairly solid boat control and a reliable roll in winds to 10 knots, rescue and self-rescue skills, knowledge of safety and environmental considerations, and the ability to be a competent member of a paddling group. The BCU three-star award defines intermediate paddler very comprehensively. But that's a post for another time. Tom Lindblade (far left) and Scott Fairty (second from left) with some of the participants in a recent Rescue Me! Thursday. This is year two of Rescue Me! 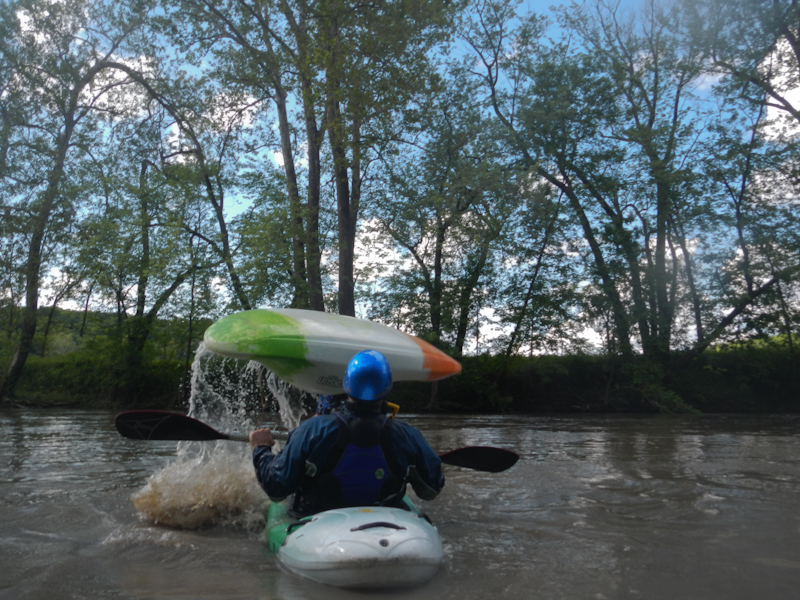 Thursdays, an initiative of the Illinois Paddling Council. These weekly training sessions were initially created in order to train the Paddlers Patrol, another IPC initiative--a volunteer group that provides safety boaters for local events, such as the Flatwater Classic, the Illinois Paddlesports Festival and the New Year's Day Paddle. The concept is simple and smart: Take advantage of the Marge Cline Whitewater Park in Yorkville, IL and the expertise of Ryan Rushton and Scott Fairty of Geneva Kayak Center (located on the course) to offer weekly training sessions on basic swiftwater rescue. The brains behind this belong to Tom Lindblade, president of the IPC, who has been an experiential educator and canoe instructor for more than four decades and was recognized three years ago with an "Excellence in Instruction" award by the American Canoe Association. 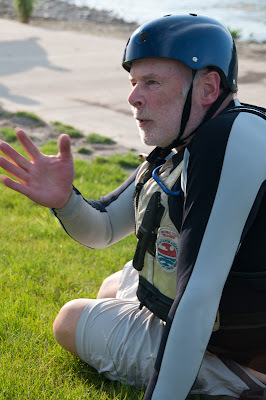 Tom Lindblade, mentor to two generations of paddlesport instructors and president of the Illinois Paddling Council. 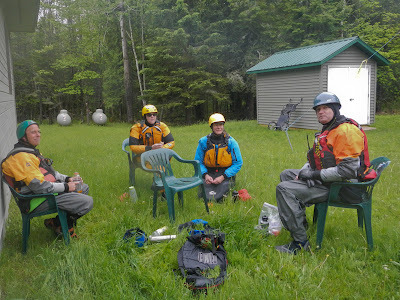 We had the good fortune to be present for this past week's session on wading rescues. This was the fourth in this year's series, following cold-water rescues, rescue ropes, and boat-over-boat rescues. Lindblade teaches most of the classes, with help from Scott Fairty. Towing, bumping and unpinning boats will follow in the coming weeks. The group wades into the river, using paddles for support. "Imagine if someone who was rescue-trained had been there when those three men died in the dam," Lindblade says, referring to the tragic incident in 2006 that led, years later, to the demolition of the deadly Glen D. Palmer Dam and the creation of the whitewater course in Yorkville. 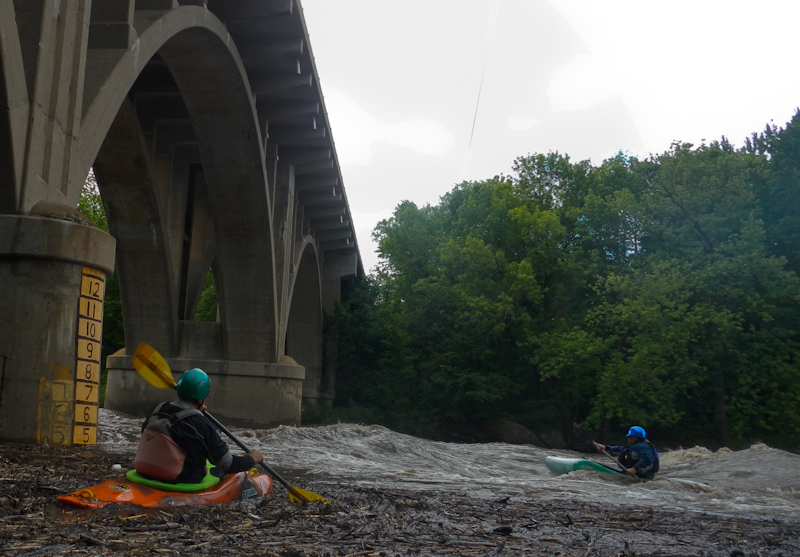 "That kind of thing can happen any time, and now we've got whitewater in the area, so these skills become more necessary." Scott Fairty (green helmet) takes six participants safely out into the current. Attendance has been good: between 9 and 17 people per week. The training is free (though non-ACA members must pay $5 for insurance when they sign the liability waiver) and no reservations are required. 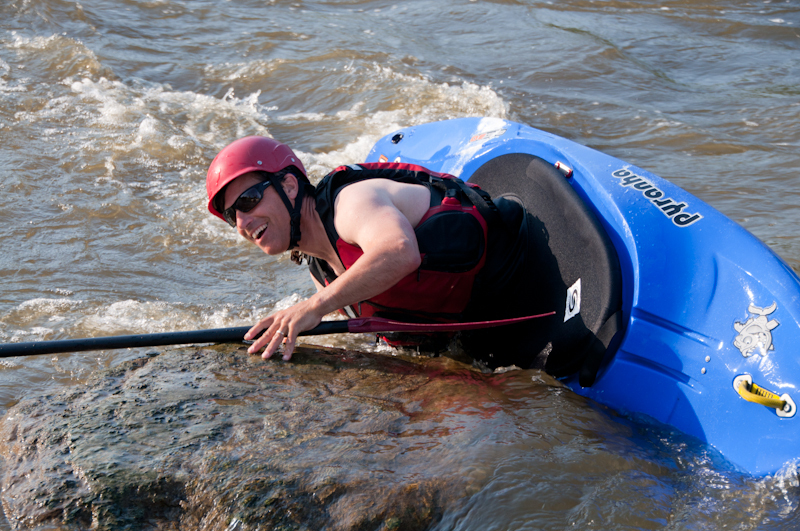 Just show up at the whitewater park at 6 p.m. on Thursdays in May, and you're part of the class. Alec simulates a pin on a rock. "This is one of the most important things we can do," Lindblade says. 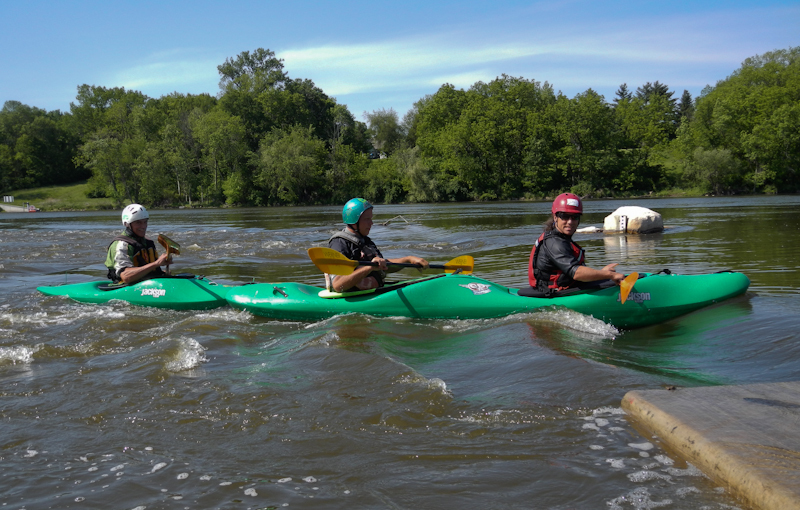 During our recent Instructor Certification Exam, we had the opportunity to try out several boats we hadn't paddled before, including the Jackson Fun Runner and the Jackson Dynamic Duo. For a moment, it appeared that we had created a Dynamic Trio. Jim Tibensky, Scott Fairty and Alec Bloyd-Peshkin. No need for solid paddling and rolling skills! All that training was for naught. River Kayak IDW/ICE -- done! 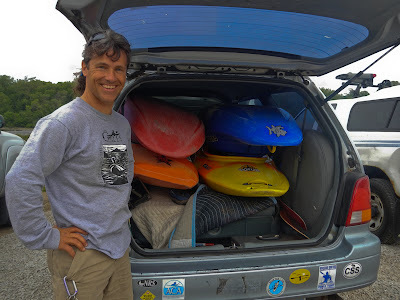 Have Kayaks, Will Travel: whitewater edition. 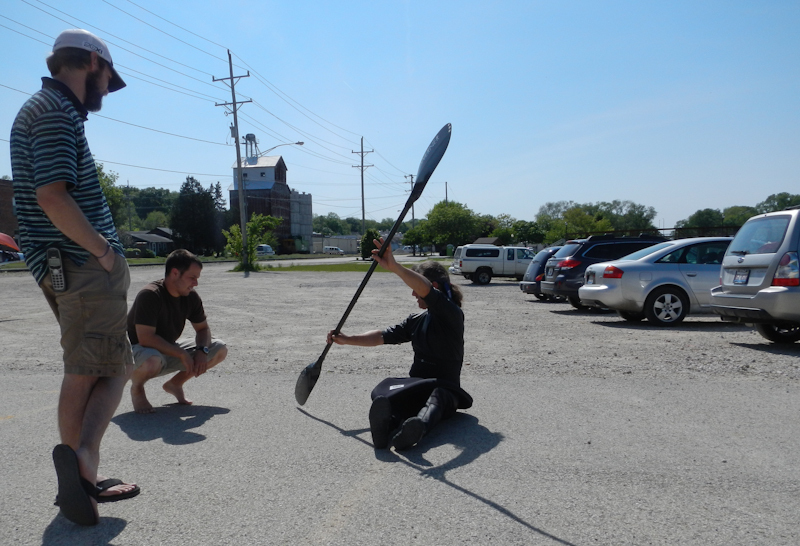 The first kayak class we took was offered by the Chicago Whitewater Association (CWA) at our local YMCA. A group of dedicated paddlers taught us to roll and paddle in the pool and on local rivers. 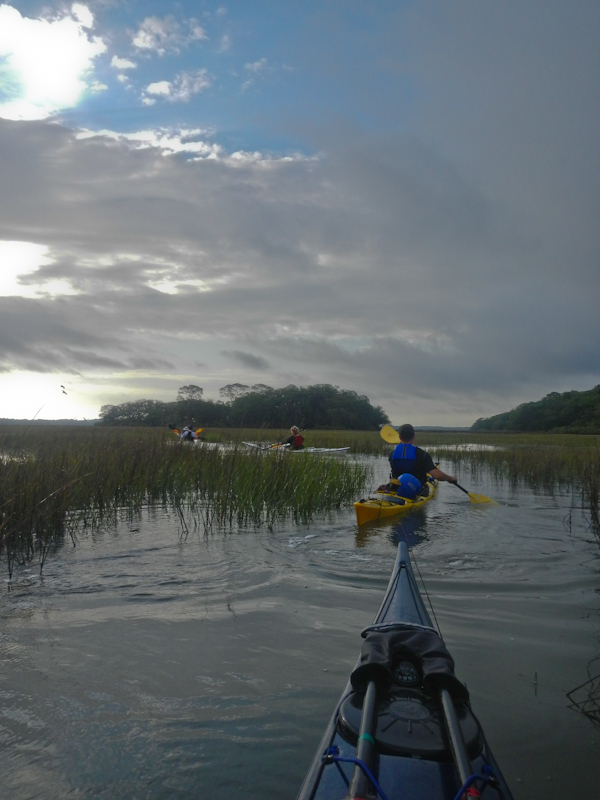 But we soon discovered sea kayaking, and nearly all of our paddling time and effort was focused on longer boats and larger bodies of water. We still assisted at the pool class we previously took, and we eventually took over as lead instructors. But our hearts belonged to open water. And so did our certifications. Then Geneva Kayak Center moved to the Marge Cline Whitewater Course in Yorkville, IL, and our interest in river paddling was rekindled. We spent considerable time playing on the quarter-mile course, took an Instructor Development Workshop with Kent Ford, traveled to Wisconsin to paddle rivers with the other staff at Geneva Kayak Center, and finally enrolled in an IDW/ICE (Instructor Development Workshop/ Instructor Certification Exam) with Instructor Trainer Educator (ITE) David Su and Instructor Trainer (IT) candidate Scott Fairty this past week. Scott Fairty (left) and David Su (right) conferring before the start of our IDW/ICE. We expected the process to be intense. The combination of training and assessing is meant to be challenging, both mentally and physically. And it was. The IDW began with a trip on the Vermillion River in Illinois. Here, instructor candidate Jim Tibensky leads a session on ferrying. 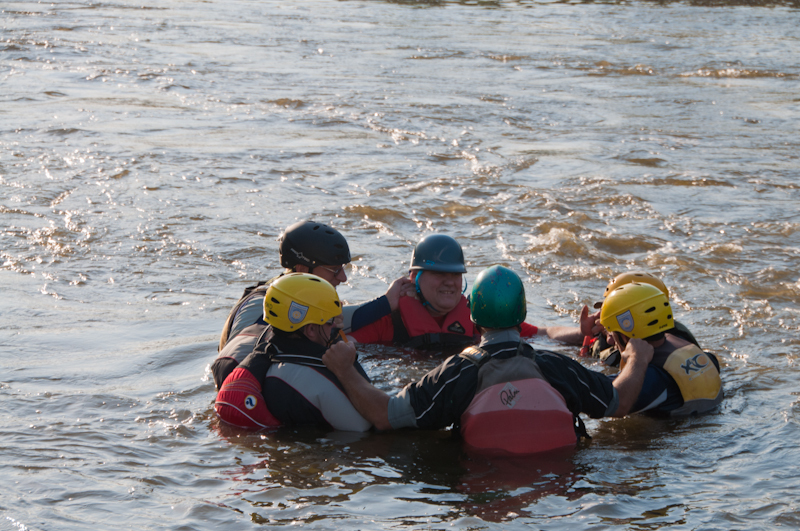 During an IDW/ICE, candidates are typically required to demonstrate paddling and rescue skills, effective coaching techniques, and knowledge about the type of paddling in which they are seeking certification. Alec conducts a spontaneous parking lot forward stroke lesson. David Su and Greg Anderson demonstrate a method for emphasizing torso rotation and shoulder protection during a sweep stroke. They also benefit from demonstrations by the ITE and/or IT about how to teach various skills. Sharon plays the part of a student as David demonstrates wet exit instruction. 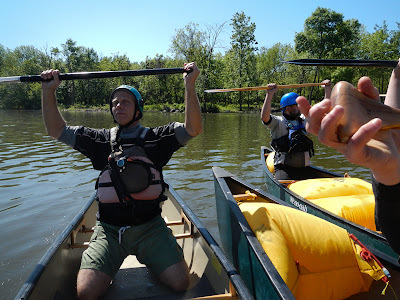 Different craft, different paddle, but many of the same techniques: We worked on canoe skills, too. Then we got an inch of rain in a 24-hour period and the Vermillion, which had been running at 1,100 CFS swelled to 11,000 CFS. When it dropped back to a healthy 5,500 CFS, we took the opportunity to run it again, this time with pushier water and some more challenging features. Greg surfs the top wave near the put-in. 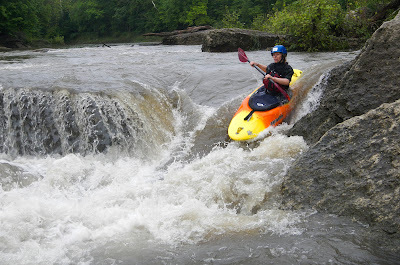 Sharon runs Wildcat on river left at the higher level. 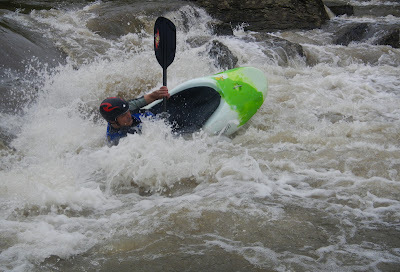 On flatter sections between features, David introduced us to an activity he uses in the pool: the "air loop"--a flip over another paddler's boat. It's a bird...it's a plane...no, it's a kayak in the air. We were also able to paddle into Matthiessen State Park, past bluffs and beneath a waterfall. It hardly seemed like Illinois. 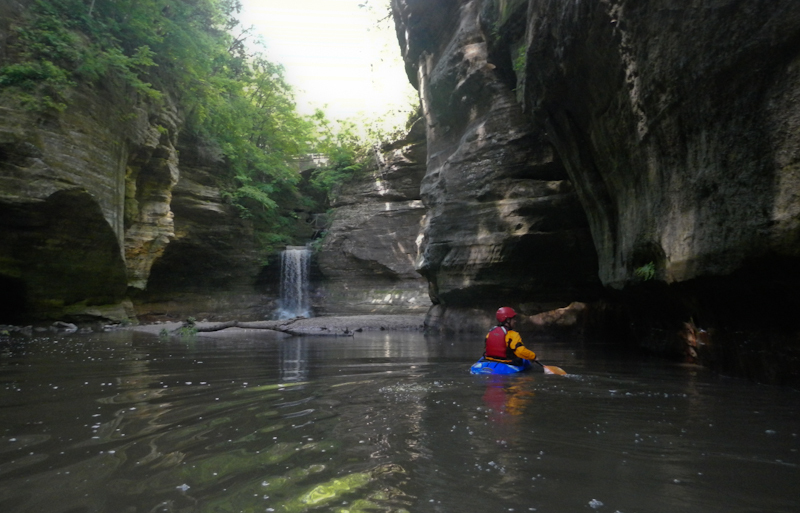 Alec paddles past caves in Matthiessen State Park. 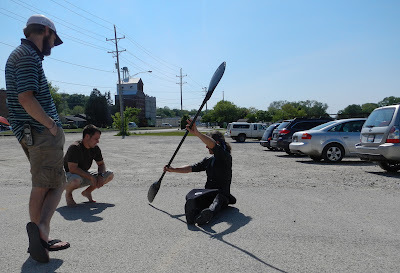 We were fortunate to go through this process with several friends and paddling partners who supported one another and, in the process, grew closer. The experience tends to solidify bonds between instructor candidates, regardless of whether or not they knew each other beforehand, and that was certainly the case here. 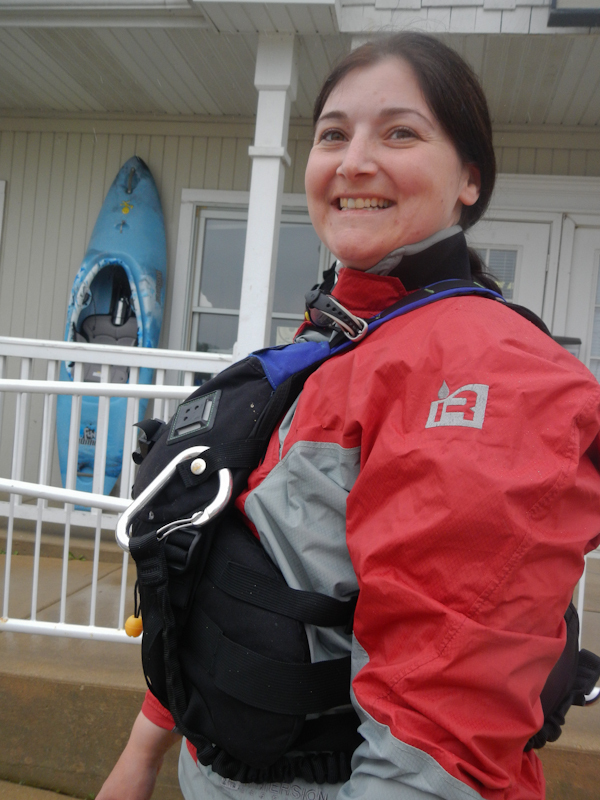 Anne Margaret, one of our fellow candidates, now a fellow instructor. 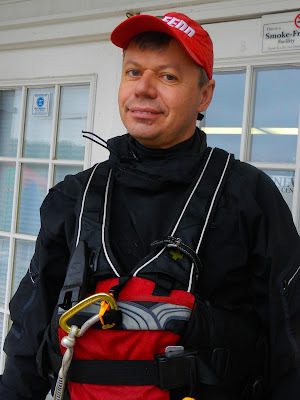 Paul Redzymski, another sea kayak coach now going through training in river kayaking, who participated in the IDW and plans to take the ICE at a later date. In some ways, an IDW/ICE replicates what works best in a class: a mix of instruction, exploration, and experience paddling in varied conditions. 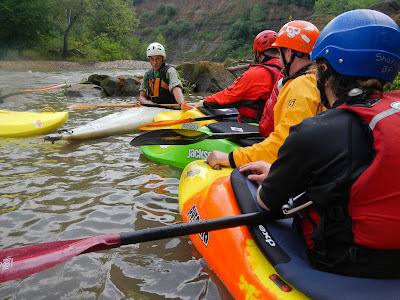 And now that we're certified in river kayaking, we look forward to bringing all of this to our students. I've been pondering the idea of coaching on a journey for a few years, and so it was a pleasure to put this into practice on a recent "destination course" I was able to assist with circumnavigating Cumberland Island, Georgia, for the Geneva Kayak Center. Our group met up in historic Saint Mary's, where we packed our boats, reviewed tidal planning and created a trip plan. 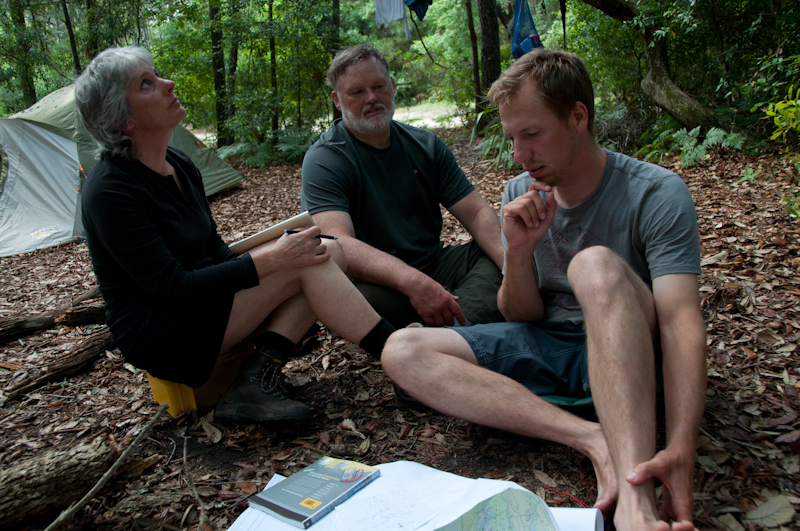 The trip began with a navigation lesson, led by Ryan Rushton (far right). The location lends itself to this sort of trip. 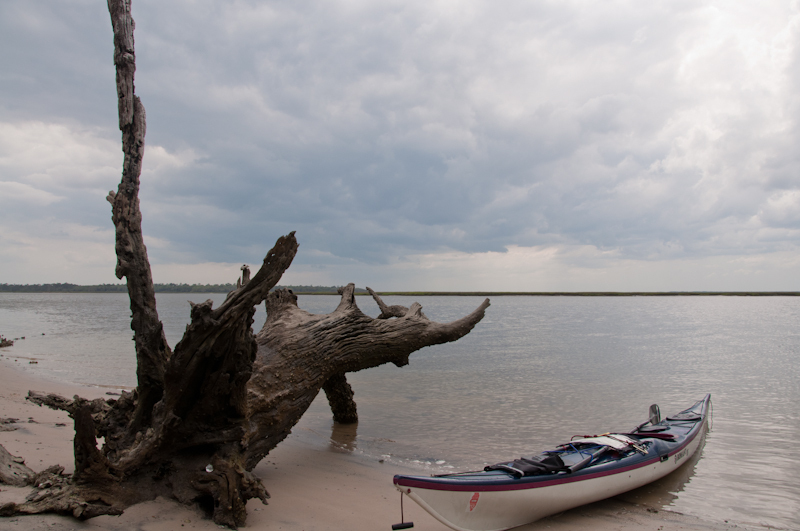 It features tides, currents, twisty rivers, islands and open ocean shoreline exposed to Atlantic swell. 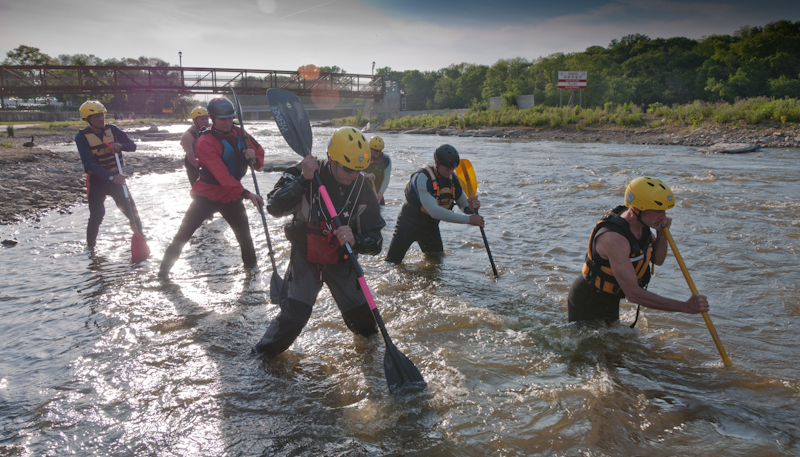 The environment poses excellent opportunities to learn and practice navigation, leadership, and rough-water skills. Christmas Creek, en route to the ocean. Which isn't to say that there isn't also a lot to see, explore and admire along the way. 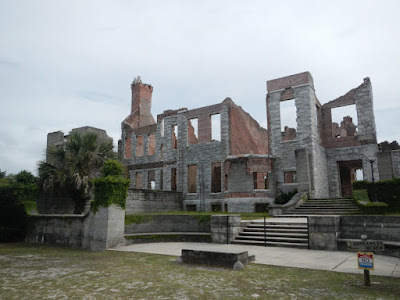 Cumberland Island has a distinctly southern feel. It's home to several historic former Carnegie family homes, feral horses, and sleepy pin oaks draped in Spanish Moss. The ruins of Dungeness, which burned in 1959. 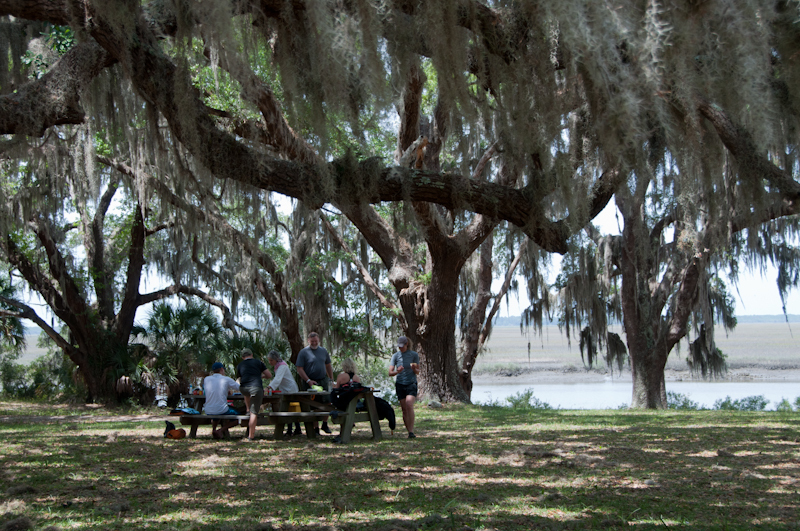 A lunch spot along the way, with Spanish moss hanging overhead. Over the course of five days, there were ample opportunities for learning, many inspired by actual conditions and events. Sometimes these were on the water, and other times while together in camp. 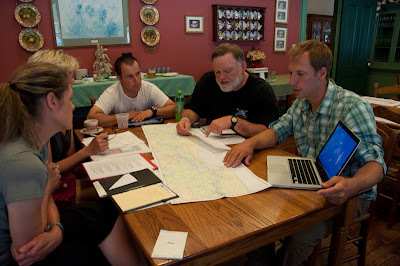 They included spontaneous rescues, discussion about vector planning, and real-life examples of leadership in action. All arose organically. Pondering the fine points of vector angles. In the end, destination courses are an ideal way to teach and learn, and they offer lots of ideas for incorporating into everyday coaching.